Aadhaar and other developing-world biometrics programs must protect users’ privacy. 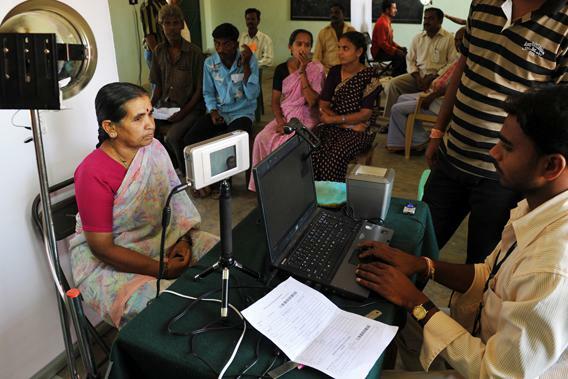 An Indian villager looks at an iris scanner for a pilot project of the Unique Identification Authority of India, or UIDAI, in the village of Chellur, northwest of Bangalore, on April 22, 2010. One of Aadhaar’s biggest promises is the opportunity to open bank accounts (which require identification). Yet, poor, marginalized Indians, even with an ID, find formal banks to be unfriendly and difficult to join. For example, the anthropologist Ursula Rao found that the homeless in India—even after registering for Aadhaar—were blocked from banking, most frequently for lack of proper addresses, but more fundamentally because, as she notes, biometric identification “cannot establish trust, teach the logic of banking, or provide incentives for investing in the formal economy.” Bank managers remain suspicious and exclusionary, even if an identity project is inclusive. Without broader reforms—including rules for who may or may not access identity details—novel identification infrastructures will become tools of age-old discrimination.